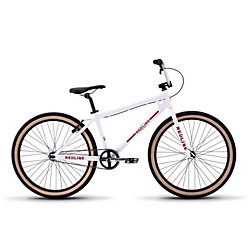 Redline Redline SQB-26 White 26"
Home / Redline SQB-26 White 26"
The Redline SQB-26 is a nod to our very first production BMX bike, the Squareback. 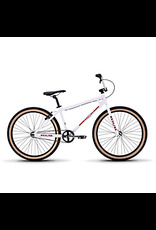 It features an aluminum alloy frame and a full chromoly steel fork. Vintage-style graphics, double head tube gussets, and the V-shaped handlebar let you roll around town in retro style. You can also bust out a few laps at your local track, thanks to the race-worthy components, including Flight cranks, a Redline Sport saddle, and Vee Speedster 26×2.125 inch tires.